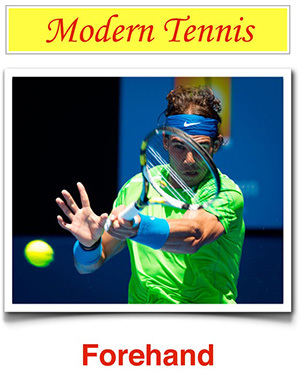 In this video, you'll discover what makes Nadal's forehand one of the greatest in history. You'll also find elements that you can copy! Rafael Nadal has one of the greatest forehand in the history of tennis. In this video, you'll find the technical elements of his forehand that make it such a great weapon for him, as well as elements that you can model in your own forehand to improve your ability to hit the ball with power, consistency, accuracy, and massive spin. His grip is somewhere between semi-western and western, which allows him to handle high balls with easy, as well as compensate for the vertical motion of his stroke and keep the ball in the court. You'll also discover how he pre-stretches the muscles that he will use during the eccentric phase of his forhand that allow for maximum racket head speed. Finally, you'll see how he uses his non-dominant hand to hold his balance over the point of contact, acting as a compression of forces that centers right on the ball at impact.